The players showed great resilience considering they played more than half the match with just ten men and the way the match ended from Star’s point of view, it felt more like a defeat than a draw. They made the perfect start when Tommy Muir was at his sharpest as he reacted before anyone else to head low past his namesake Lewis in the home goal. There was no sitting back on their lead and the visitors were soon back on the front foot as they looked to extend their superiority. It took almost half an hour for the home side to record an effort of note but a fine run from Fraser Neave ended with a crisp right foot shot that brought out an excellent save from Vinnie Parker. Star deservedly doubled their lead when Sloan delivered a superb free kick that found Muir unmarked at the back post and he headed high past the Rovers keeper on 36 minutes. With just seconds left of the opening period, the match was turned on its head. Muir, who had been a constant thorn in the home side’s defence, ran clear off the last man but keeper Muir came out bravely to dive at his feet and grab the ball. However, Tommy caught the keeper with his boot as he went for the ball, and after consulting his assistant the referee brandished a red card for dangerous play. The keeper managed to see out the remaining seconds of the half but unfortunately his concussion was bad enough that he was unable to come out for the second half. With no substitute keeper on the bench, defender Sean Guiney put on the gloves for the second half, and though Star played really well in that period, the one big disappointment was that they never really tested the stand in keeper. Buoyed by their numerical advantage Rovers pulled a goal back from a corner when defender Kieran Ainslie rose highest to head past Parker and it was game on. Yet again though Star coped comfortably with what little Rovers could throw at them and as the game wore on it was they who looked the more likely to score the next goal. With just two minutes left the home side were also reduced to ten men when Scott Main was shown a red card for fouling substitute Corey Thomson as he bore in on goal. Unfortunately for Star the offence took place just inches outside the box and from the resultant free kick stand in keeper Guiney had an easy save from O’Sullivan’s effort. In the last seconds of the standard 90 Thomson had a glorious chance to wrap up the points as he ran clean through, but fluffed his lines. 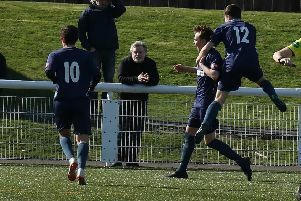 In the fifth minute of stoppage time though disaster struck when the ball was played down the right channel to Malcolm but Hugh Cameron seemed to have things under control. However, Parker came charging out of his goal and the Rovers forward nicked the ball past the onrushing keeper and was clearly taken out. Darren Smith then stepped up and sent Parker the wrong way and the points were shared.